AndAlso Books is publishing an anthology of creative non-fiction short stories about the Spanish Flu’s travels through Queensland in 1919. We are calling for between 8-10 writers to contribute to the book, which will be published in early 2019 (the centenary anniversary of the epidemic). Stories will be between 3500-5000 words, and writers will be paid for their work. The epidemic was uniquely dramatic, and the stories we need should be distinctive and diverse––but they must be based on research about real people and places. We are particularly interested in regional stories, and are keen to hear from writers in central and north Queensland who can tell stories from their own local areas. 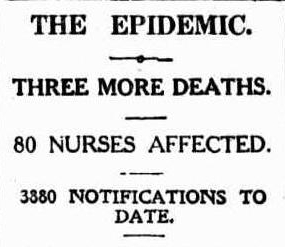 We specifically want to hear from Indigenous writers who might be willing to tell stories about the terrible tragedies the ‘flu’ brought into Barambah (now Cherbourg) and Taroom (now Woorabinda) communities in 1919. The anthology––not yet titled––is edited by Melissa Fagan and Matthew Wengert. AndAlso Books can assist prospective writers with some research. Expressions of interest are due Friday 24 February 2018.